Lycogala epidendrum: Wolf's Milk Slime Mold. 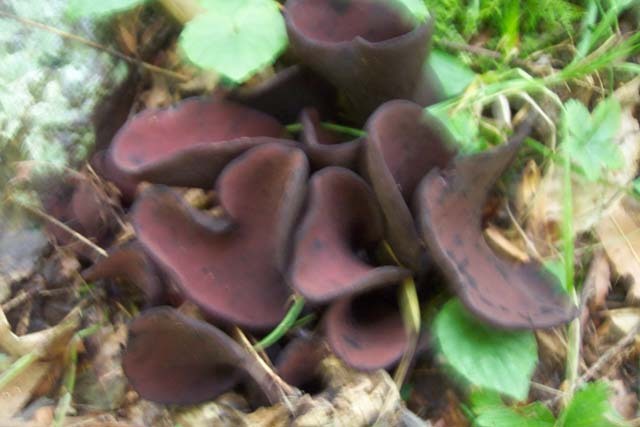 Location: Big Schloss Connector Trail, GWNF, VA.
Wynnea americana, Moose Antlers or Rabbit Ears: Dark brown outside surface, red to red brown inner surface growing darker with age. Rare but we saw 3 clusters over a 2 day period in the Ramsey's Draft Wilderness, GWNF, VA. The first cluster was releasing spores as we watched! 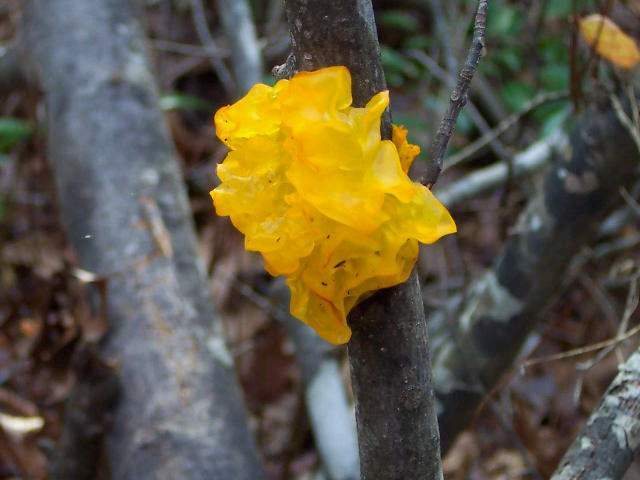 Tremella mesenterica: Witch's Butter. Edible. Used in soups. 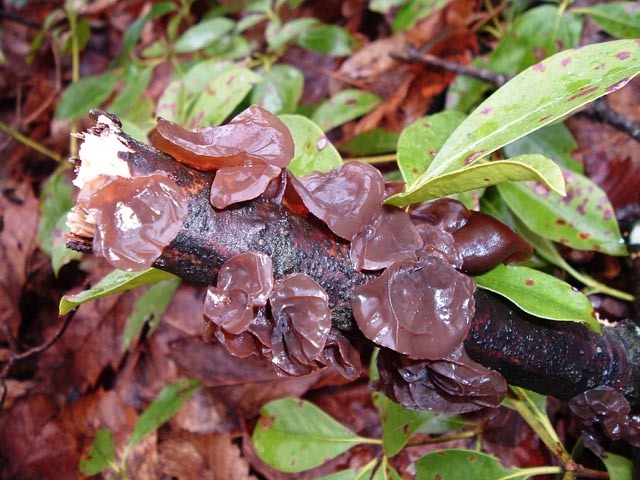 Location: Prince William National Park, VA.
Auricularea auricula - Wood Ear or Tree Ear Mushroom: Thin, dark brown to black and crusty during dry spells. Can adsorb 63 times its weight in wet periods and looks like this. Edible. Used in Hot and Sour Soup. Photo by Gary Bailey. Location: #1 waterfalls, White Oak Canyon, SNP, VA.
Fulogo septica: Scrambled Egg Slime Mold. Grows on trees, logs and stumps. Location: Lake Sherwood Tral, MNF, WV. 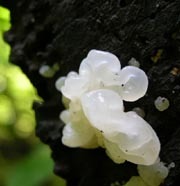 White-egg Bird's Nest Fungus (Crucibulum laeve). This fungi is only 0.25 inches across. The yellowish ones are young. The dark , open ones are the adult ( or beyond adult). See the white, roundish bodies? They're the eggs and were originally in "the nest". Location: Jug Bay, Patuxent River, MD. Photo by Ken Clark. Scutellinia scutellena: Eyelash Cup. 1/4 to 3/4 inch fungi edged in "eye lashes" (not visible here). Location: Allegheny Mountain Trail, Lake Sherwood, MNF, WV. 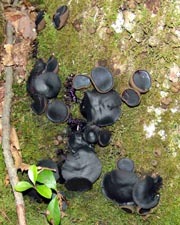 Bulgaria inquinans, Black Jelly Drops: Up to about 1.5 inches in diameter. Found on dead hardwoods. External surface is scruffy brown while the inside is smooth, black and jelly-like. Location: Allegheny Tr, WV. Photo by Eric Shereda. Tremella fuciformis - Snow Fungus, Silver Ear Fungus: Grows on branches and trees in wet areas. Used in Asian dishes. It's flavorless but has an interesting texture - rubbery yet crunchy. Location: Flag Ponds, MD. Photo by Ken Clark. Stemonitis splendens - Chocolate Tube Slime or Pipe Cleaner Slime. 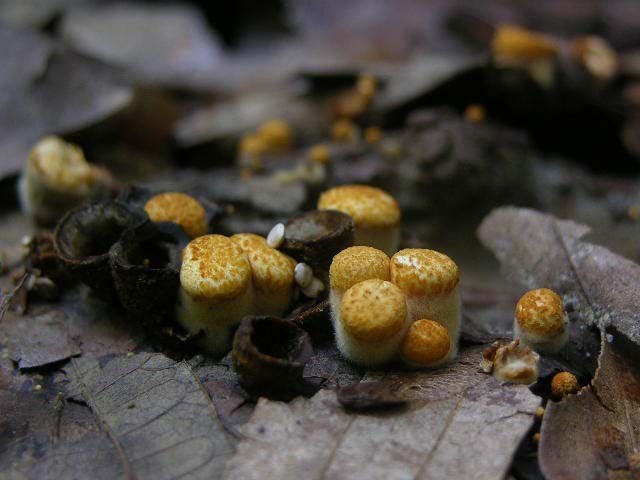 A white mass produces these minute tubes found on dead wood and leaves. Common throughout the region. Location: Massanutten Mt, VA. Photo by Ken Clark.